How can obesity be treated? Click on each factor above to find out more. How have global obesity trends changed? What complications are linked to obesity? Click on each of the obesity-related complications below to find out more. What are the benefits of a weight loss of 5% or more? How does BMI affect risk of mortality? Adapted from Prospective Studies Collaboration. Body-mass index and cause-specific mortality in 900,000 adults: collaborative analyses of 57 prospective studies. Lancet. 2009;373(9669):1083–1096. Obesity is associated with mental health problems. What is the link between obesity and cardiovascular disease? BP=blood pressure; CV=cardiovascular; DBP=diastolic blood pressure; HbA1c=glycated haemoglobin; HDL=high density lipoprotein; SBP=systolic blood pressure. Does BMI affect physical functioning? *SF-36=international health-related quality of life survey. Adapted from Hopman WM, Berger C, Joseph L, et al. The association between body mass index and health-related quality of life: data from CaMos, a stratified population study. Qual Life Res 2007; 16:1595–1603. Why is it hard to lose weight and keep it off? Want to learn more about the science behind obesity? View our obesity mode of disease video. Adapted from Mann T, Tomiyama AJ, Westling E, Lew AM, Samuels B, Chatman J. Medicare's search for effective obesity treatments: diets are not the answer. Am Psychol. 2007;622(3):220–233. Click here to explore our patient interaction tools to aid initiation or follow-up of dialogue with patients about their obesity management. Explore the science behind obesity interactive infographic to learn more about the factors inside and outside the body that affect a person’s likelihood of developing obesity. Wright SM, Aronne LJ. Causes of obesity. Abdominal Imaging. 2012; 37:730–732. National Institutes of Health. Clinical Guidelines On The Identification, Evaluation, And Treatment Of Overweight And Obesity In Adults. Available at: http://www.nhlbi.nih.gov/guidelines/obesity/ob_gdlns.pdf. Last accessed: March 2018. NIH. What causes overweight and obesity? Available at: https://www.nhlbi.nih.gov/health/health-topics/topics/obe/causes. Last accessed: March 2018. Sumithran P PL, Delbridge E, Purcell K, Shulkes A, Kriketos A, Proietto J. Long-term persistence of hormonal adaptations to weight loss. New England Journal of Medicine. 2011; 365:1597–1604. Pampel FC, Denney JT, PM K. Obesity, SES, and economic development: a test of the reversal hypothesis Social science and medicine. 2013; 74:1073-1081.
WHO. Obesity: Preventing and managing the global epidemic. Available at: http://www.who.int/iris/handle/10665/42330 Last accessed: March 2018. Allison DB, Downey M, Atkinson RL, et al. Obesity as a Disease: A White Paper on Evidence and Arguments Commissioned by the Council of The Obesity Society. Obesity 2008; 16:1161–1177. American Medical Association. A.M.A Adopts New Policies on Second Day of Voting at Annual Meeting. Obesity as a Disease. Available at: http://news.cision.com/american-medical-association/r/ama-adopts-new-policies-on-second-day-of-voting-at-annual-meeting,c9430649. Last accessed: March 2018. Mechanick JI, Garber AJ, Garvey WT. American Association of Clinical Enodocrinologists’ Position Statement on Obesity and Obesity Medicine. Endocrine Practice. 2012; 18:642-648. Bray G, Kim K, Wilding J. Obesity: a chronic relapsing progressive disease process. A position statement of the World Obesity Federation. Obesity Reviews. 2017; 18:715–723. Frühbeck G, Sbraccia P, Nisoli E. 2015 Milan Declaration: A Call to Action on Obesity - an EASO Position Statement on the Occasion of the 2015 EXPO. Obesity Facts. 2016; 9:296-298. Kaplan L, Golden A, Jinnett K, et al. Perceptions of Barriers to Effective Obesity Care: Results from the National ACTION Study. Obesity. 2018; 26:61-69. Lobstein T, Brinsden H, Gill T, et al. Comment: obesity as a disease – some implications for the World Obesity Federation's advocacy and public health activities. Obesity reviews. 2017; 18:724–726. World Health Organization. Obesity and Overweight Factsheet no. 311. Available at: http://www.who.int/mediacentre/factsheets/fs311/en/. Last accessed: March 2018. Global Health Observatory. Prevalence of Obesity, ages 18+, 2016 (age standardized estimate) Male. 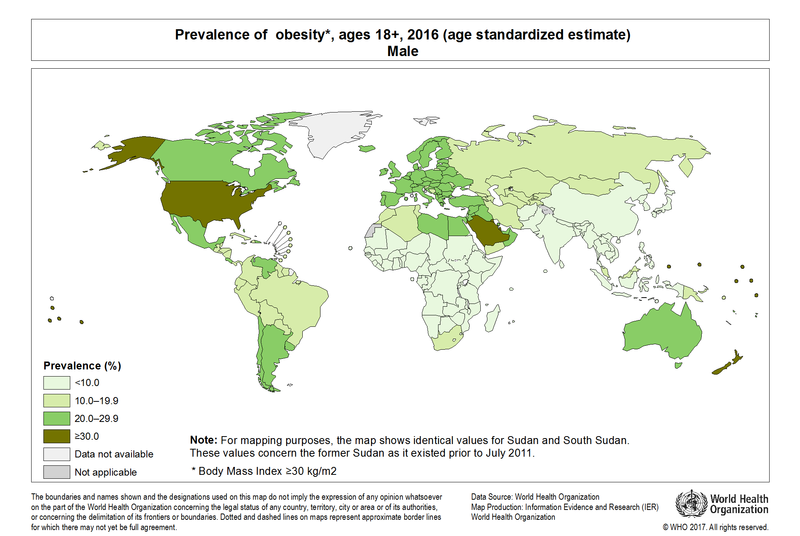 Available at: http://gamapserver.who.int/mapLibrary/Files/Maps/Global_Obesity_2016_Male.png. Last accessed: March 2018. Global Health Observatory. Prevalence of Obesity, ages 18+, 2016 (age standardized estimate) Female. 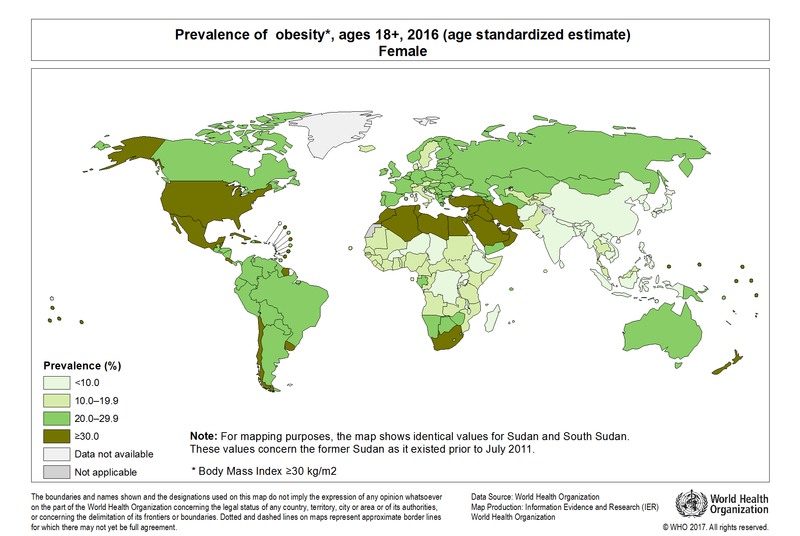 Available at: http://gamapserver.who.int/mapLibrary/Files/Maps/Global_Obesity_2016_Female.png. Last accessed: March 2018. Yuen M, Earle R, Kadambi N, et al. A systematic review and evaluation of current evidence reveals 195 obesity-associated disorders. Poster abstract presentation at: The Obesity Society Annual Meeting at ObesityWeek 2016; Oct. 31 - Nov. 4, 2016; New Orleans. Romero-Corral A, Caples SM, Lopez-Jimenez F, et al. Interactions between obesity and obstructive sleep apnea: implications for treatment. Chest. 2010; 137:711-719. Saydah S, Bullard KM, Chen Y, et al. Trends in Cardiovascular Disease Risk Factors by Obesity Level in Adults in the United States, NHANES 1999-2010. Obesity. 2014; 22:1888–1895. Health Effects of Overweight and Obesity in 195 Countries over 25 Years. New England Journal of Medicine. 2017. Guh DP, Zhang W, Bansback N, et al. The incidence of co-morbidities related to obesity and overweight: a systematic review and meta-analysis. BMC Public Health. 2009; 9:1-20. Centers for Disease Control and Prevention. Cancers Associated with Overweight and Obesity Make up 40 percent of Cancers Diagnosed in the United States. Available at: https://www.cdc.gov/media/releases/2017/p1003-vs-cancer-obesity.html. Last accessed: March 2018. World Obesity Federation. Healthcare cost of consequences of high BMI. Available at: http://docs.wixstatic.com/ugd/6599c5_2a8fa0968efd4854b74f399abb3078c0.pdf?index=true. Last accessed: March 2018. World Heart Federation. The costs of CVD. Available at: http://www.championadvocates.org/en/champion-advocates-programme/the-costs-of-cvd. Last accessed: March 2018. Knowler WC, Barrett-Connor E, Fowler SE, et al. Reduction in the incidence of type 2 diabetes with lifestyle intervention or metformin. The New England Journal of Medicine. 2002; 346:393–403. Wing RR, Lang W, Wadden TA, et al. Benefits of modest weight loss in improving cardiovascular risk factors in overweight and obese individuals with type 2 diabetes. Diabetes Care. 2011; 34:1481–1486. Dattilo AM, Kris-Etherton PM. Effects of weight reduction on blood lipids and lipoproteins: a meta-analysis. The American Journal of Clinical Nutrition. 1992; 56:320–328. Riddle DL, PW S. Body Weight Changes and Corresponding Changes in Pain and Function in Persons With Symptomatic Knee Osteoarthritis: A Cohort Study. Arthritis Care & Research 2013; 65:15–22. Tuomilehto H, Seppa J, Uusitupa M, et al. The impact of weight reduction in the prevention of the progression of obstructive sleep apnea: an explanatory analysis of a 5-year observational follow-up trial. Sleep Medicine 2014; 15:329–335. Foster GD, Borradaile KE, Sanders MH, et al. A randomized study on the effect of weight loss on obstructive sleep apnea among obese patients with type 2 diabetes: the Sleep AHEAD study. Archives of Internal Medicine. 2009; 169:1619–1626. Warkentin LM, Das D, Majumdar SR, et al. The effect of weight loss on health-related quality of life: systematic review and meta-analysis of randomized trials. Obes Rev. 2014; 15:169-182. Kuna ST, Reboussin DM, Borradaile KE, et al. Long-term effect of weight loss on obstructive sleep apnea severity in obese patients with type 2 diabetes. Sleep. 2013; 36:641–649A. Wright F, Boyle S, Baxter K, et al. Understanding the relationship between weight loss, emotional well-being and health-related quality of life in patients attending a specialist obesity weight management service. J Health Psychol. 2013; 18:574-586. Whitlock G, Lewington S, Sherliker P, et al. Body-mass index and cause-specific mortality in 900 000 adults: collaborative analyses of 57 prospective studies. Lancet. 2009; 373:1083-1096. National Obesity Observatory. Obesity and Mental Health. 2011. Available at: https://khub.net/c/document_library/get_file?uuid=18cd2173-408a-4322-b577-6aba3354b7ca&groupId=31798783. Last accessed: March 2018. Hopman WM BCJL, Barr SI, Gao Y, Prior JC, Poliquin S, Towheed T, Anastassiades T,. The association between body mass index and health-related quality of life: data from CaMos, a stratified population study. Qual Life Res. 2007; 16:1595-1603. Syddall H, Martin H, Harwood R, et al. The SF-36: a simple, effective measure of mobility-disability for epidemiological studies. J Nutr Health Aging 2009; 13:57–62. Schwartz A, Doucet E. Relative changes in resting energy expenditure during weight loss: a systematic review. Obesity Review. 2010; 11:531–547. Rosenbaum M, RL L. Adaptive thermogenesis in humans. Int J Obes (Lond). 2010; 34 (suppl 1):S47–S55. Rosenbaum M, Kissileff HR, Mayer LE, et al. Energy intake in weight-reduced humans. Brain Res. 2010; 1350:95-102. Lenard N, Berthoud H. Central and Peripheral Regulation of Food Intake and Physical Activity: Pathways and Genes. Obesity. 2008; 16(Suppl 3):S11-S12. Mann T, Tomiyama AJ, Westling E, et al. Medicare's search for effective obesity treatments: diets are not the answer. The American Psychologist. 2007; 62:220–233. MacLean PS, Wing RR, Davidson T, et al. NIH working group report: Innovative research to improve maintenance of weight loss. Obesity (Silver Spring). 2015; 23:7-15. AACE/ACE. Clinical practice guidelines for comprehensive medical care of patients with obesity - executive summary. Available at: https://www.aace.com/files/guidelines/ObesityExecutiveSummary.pdf. Last accessed: March 2018. Jensen MD, Ryan DH, Apovian CM, et al. 2013 AHA/ACC/TOS guideline for the management of overweight and obesity in adults: a report of the American College of Cardiology/American Heart Association Task Force on Practice Guidelines and The Obesity Society. Circulation. 2014; 129:S102-138. Mingfang L, B C. Pharmacotherapy for obesity British Journal of Clinical Pharmacology 2009; 68:804–810. Obesity Action Coalition. Bariatric surgery. Available at: http://www.obesityaction.org/obesity-treatments/bariatric-surgery. Last accessed: March 2018. Rethink Obesity® is a registered trademark of Novo Nordisk A/S. 2017 © Novo Nordisk A/S, Novo Allé, DK-2880 Bagsværd, Denmark. The site you are entering is not the property of, nor managed by, Novo Nordisk. Novo Nordisk assumes no responsibility for the content of sites not managed by Novo Nordisk. Furthermore, Novo Nordisk is not responsible for, nor does it have control over, the privacy policies of these sites.